100 Park Drive ♦ Troy, Mich.
Best Lights Triangular LED 630-watt indirect series for indoor tennis facilities and air structures is saving clients 50 percent on energy bills, with up to 50 percent increased light levels on the courts. Through the use of Best Lights’ proprietary reflector design, the company is able to produce more light using less wattage, unlike other manufactures that reduce electric bills while reducing light levels. Best Lights’ patented Triangular LED design has superior stability and light performance, while protecting the LEDs from bugs and dust collecting on top. This design also allows for the elimination of the need for lenses, which reduces light output by 20 percent. Best Lights reflectors magnify and reflect the light out of the luminaire at specific angles, with the intensity to reflect light off the ceiling, producing superior light levels at the playing surface. This design also eliminates having to add and wire many additional luminaires that create hot spots or hot lines seen on the ceilings in other designs. The silent dimmable electronic drivers inside the luminaire. When retrofitting an existing facility, Best Lights utilizes the existing wiring and attachment points, and installation is simple and easy. Best Lights’ 630-watt Triangular LED Indirect Series produces more light than a brand new 1,000-watt HID lamp in existing fixtures. With a 60,000-hour life, Best Lights’ luminaires can last 20 years. Also available are wireless dimming controls. The lights pay for themselves, with reduced energy costs, while increasing light levels—a plus for any club. Utility rebates and financing are available in most states. Since 1965, Century Tennis has been dedicated to the growing sport of tennis by building quality tennis courts and providing a specialized service to the tennis club industry, as well as the private community. By maintaining a high-quality of service and customer satisfaction over the years comes a trust that is ever so hard to attain. In order to build great tennis courts, you have to start at the bottom with an understanding of soil conditions and converting it to a good base. Laser-controlled road graders enable Century Tennis to build with accuracy. Building Post-Tensioned Concrete instead of the old asphalt type courts are proving to be a great alternative for “crack-free” tennis courts. Whether it is a hard court with the softness of Deco-Turf or Classic Turf Rubber or whether it is a soft court like Har-tru or Hydro Court, or a surface that offers a little of both like Nova Synthetic Turfs, Century Tennis can deliver. The company is a member of the American Sports Builders Association (ASBA), Better Business Bureau (BBB) and the Long Island Builders Institute (LIBI). Century Tennis’ building techniques meet and or exceed those of the ASBA and the USTA and with its “Certified Tennis Court Builder” staff assures this quality. The company’s intention is to deliver the very best tennis courts for the most demanding players and tennis club owners. The Farley Group has installed more than 20 tennis bubbles in the New York City and Long Island areas, helping tennis facilities extend their season into the winter months. For seasonal or permanently installed tennis bubbles, The Farley Group is your number one source for quality, service and dependability. As a manufacturer, supplier, installer and service provider of air-supported structures, The Farley Group works with you from conception to implementation and beyond. The company’s philosophy is built around the belief that a customer never leaves The Farley Group—from project planning and installation to ongoing service and maintenance, we become a trusted member of your team. The company’s expert staff of sales consultants, designers and highly-skilled production and service professionals are well-experienced in all facets of air structure technology, ready to help you through every phase of your tennis bubble project. The first Har-Tru court was constructed in Hagerstown, Md. in 1932 and the brand was born. Har-Tru is consistent, timeless and intimately acquainted with some of the greatest moments in the history of the game. More than 88 percent of the world’s champions learned to play on clay. Har-Tru Sports is a global sports company with its roots in the tennis industry. The company’s expertise in tennis includes more than 200 years of collective experience on its team. Based in Charlottesville, Va., Har-Tru is the leading provider of clay courts, court consultation, court accessories and maintenance equipment in the tennis industry. Har-Tru helps develop champions, but we don’t stop at clay. Har-Tru Sports are champions of the sport of tennis wherever it is played. The company’s court equipment and accessories are made with the same integrity that it’s been famous for since it began 85 years ago. The goal of Har-Tru Sports is to increase the quality of the game and the enjoyment of playing it. Building on the company’s unique experience, it works to create an exceptional future for the sport you love. Har-Tru Sports is here to make your game the best it can be every time you set foot on a court. For more information about Har-Tru Sports, visit HarTru.com. Since 2010, Lux-Craft Inc. has been involved in research and development of the newest LED technologies for sport facilities. In 2013 as a leader in the field, first ever 100 percent LED system was installed at Robbie Wagner Tennis Academy. Today, through hard work and dedication Lux-Craft Inc. is the only company who is able to deliver indirect LED lighting manufactured in the USA with direct replacement capability of old HID systems. LED systems outperforms old 1000-watt HID systems by delivering crisp and clear lighting, while reducing electricity cost by as much as 70 percent. By utilizing the latest technologies with years of research and development, Lux-Craft Inc. manufactures high-intensity light products, designed for industrial and commercial applications. Currently, the company has a line of lighting products for indoor and outdoor applications. Lux-Craft Inc. is also the first to introduce an outdoor indirect light fixture. The new outdoor fixture minimizes the glare and provides bright day-like lighting. MBR Builders is a nationwide expert in all facets of construction and renovations of metal buildings for the indoor tennis market. With more than 50 years of combined experience of their highly qualified staff, MBR offers a full range of services for your tennis club. Besides being a Certified Butler Builder for new construction and re-roofing systems, MBR Builders also works closely with their clientele to provide easy and cost-efficient ways to lower operating costs of their existing buildings. With a multitude of high quality insulation and lighting systems, MBR Builders can match your individual club needs to the perfect energy-efficient system for your facility. MBR’s offers LED lighting systems, such as The Watt Slayer Series, which have been extremely successful in reducing energy consumption, while giving their clientele the light levels they desire. MBR Builders also offers a quality line of indoor tennis accessories, including custom backdrop curtains and divider nets. Check out MBR’s Web site at MBRBuilders.com to learn more about their services or request a free estimate. MBR’s services include: New construction, re-roofing, interior ceiling systems, lighting systems, curtains and wire work, and tennis accessories. Take that first step to the exceptional tennis facility of your dreams! For more than 20 years, Outdoor Living FX’s talented staff has transformed the landscape of many Long Island homes. Whether you enjoy spending hours with friends on your multi-purpose game court, practicing your short game on your own putting green or entertaining around your outdoor living space, let Outdoor Living FX’s creative design team build it for you! Call today to schedule your transformation at (631) 882-1932. Velvetop Products is a family-owned and operated business since 1968. 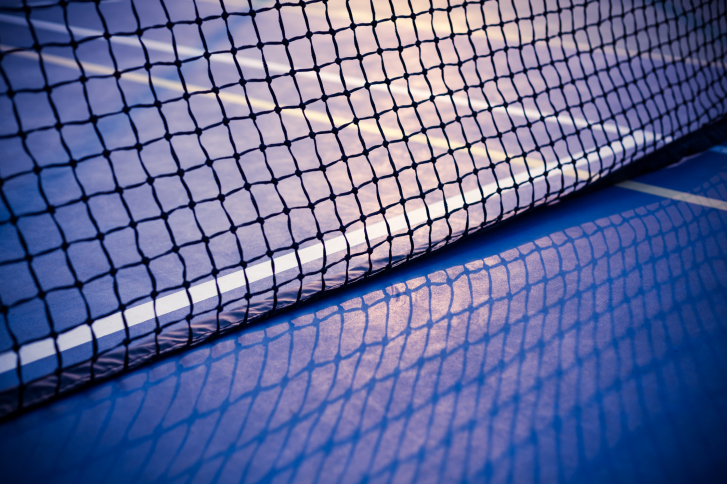 We are a stocking distributor of a full line of tennis court materials and equipment. For more information, call (631) 427-5904, e-mail BWalsh@Velvetop.com or visit Velvetop.com.